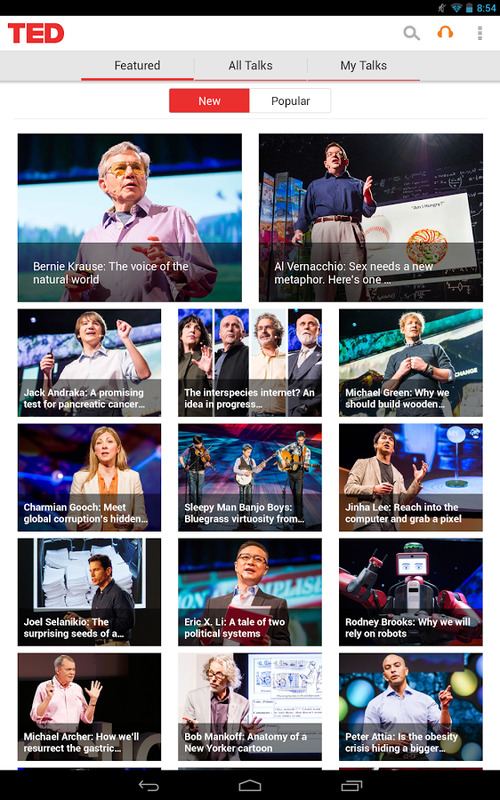 TED has made a name for itself all over the world with its influential and engaging talks encompassing topics from technology to design, medicine, business, sociology, and more. 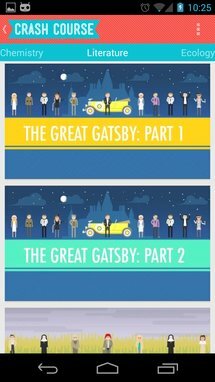 TED talks aren't educational in the traditional sense of the term, they resemble stories more than lectures, but you will leave each one feeling richer and empowered with a better comprehension of its subject matter. They helped me understand the political system in China, appreciate the difference between faith and extremism, learn more about deep brain stimulation, and gush at the creativity of an artist with hand tremor. The TED Android app gives you access to all of the site's talks organized by tags, popularity, or recency. Each talk has an information card with an explanation of the topic and a blurb about the speaker. 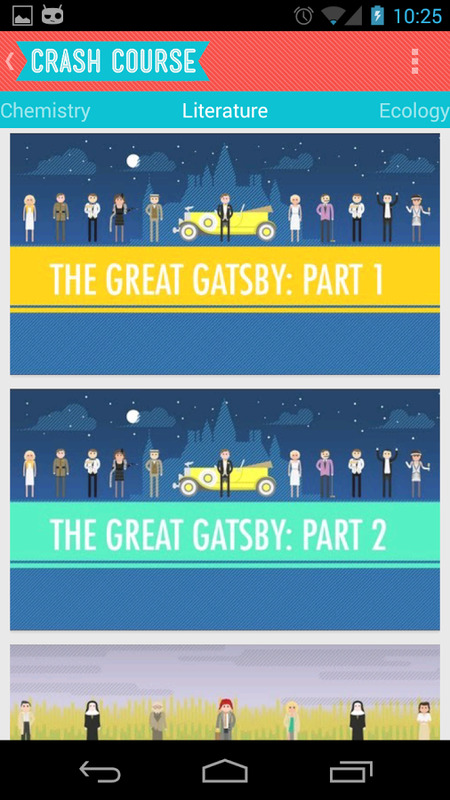 Talks can be bookmarked, shared, streamed, or downloaded. They also direct you to similar talks in the Watch Next section and to more material on the topic in Related Tags. 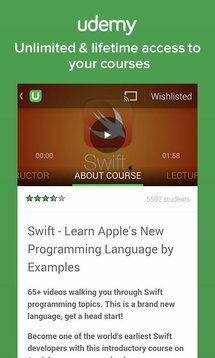 But one of the app's most compelling features is the ability to turn on subtitles, which help greatly in understanding the conference if English isn't your (or the speaker's) native language. 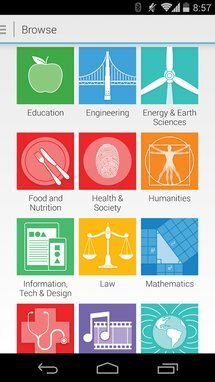 Coursera is a free web service that offers more than 600 courses spanning topics from art to engineering, health, law, physics, but with a big focus on computer sciences. 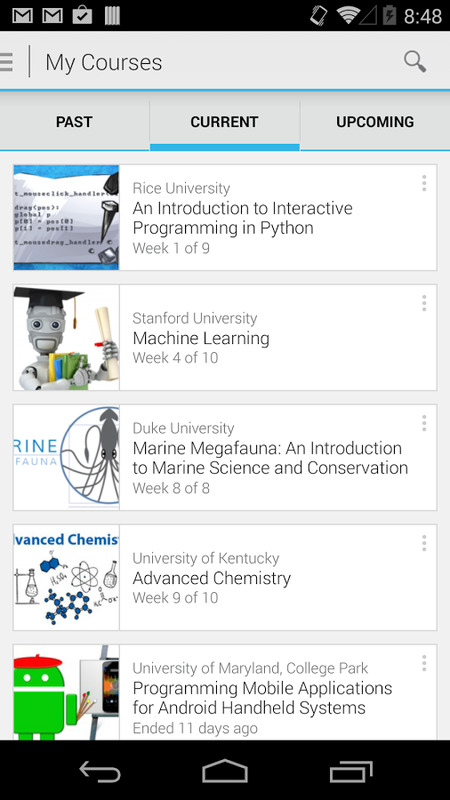 Each course is usually prepared by a professor—or at least an expert in the field—and extends over several weeks with an average workload requirement per week. 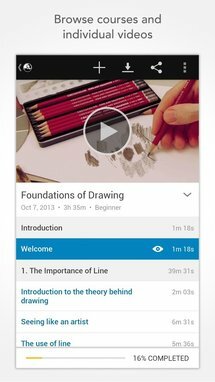 Courses include videos with associated reading documents, and are followed by quizzes you have to complete to get a passing grade. 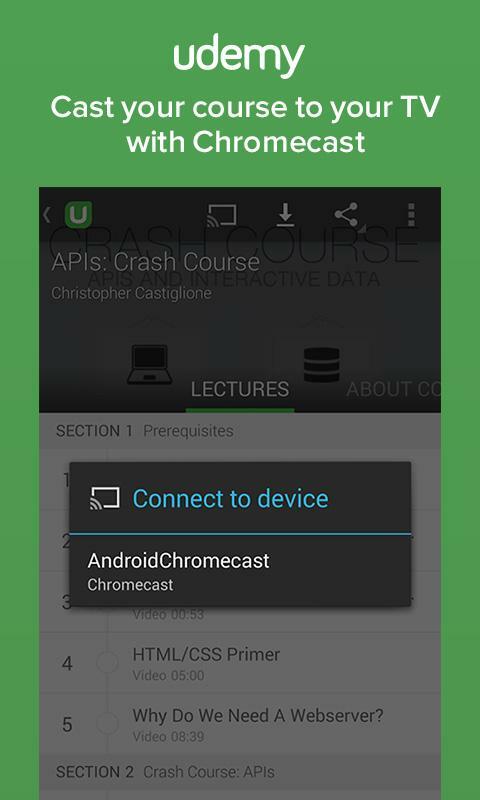 As with most of the apps on this list, Coursera's videos can be streamed or downloaded for offline viewing. 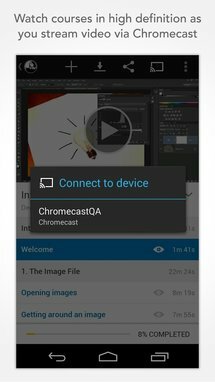 They come with subtitles too, have a handy 10 second rewind button, and can be streamed to your television via the Chromecast. 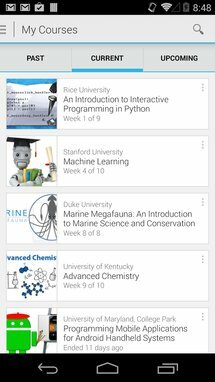 The only downside to the app is that you will have to create a Coursera account—no Google sign-in—in order to access any of its content, but that's a small price to pay given that the app and all of the courses are free. I may finally start learning more about psychology, my most recent passion/calling. Think of Lynda as Coursera but in a more professional setting, with higher quality material and more legitimacy. 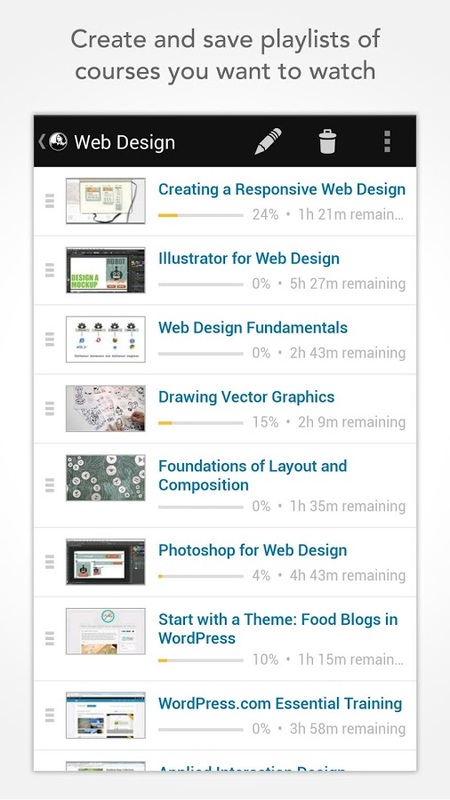 Lynda courses are organized by topics, which are geared toward software and practical skills—think more design and development, less medicine and sociology. 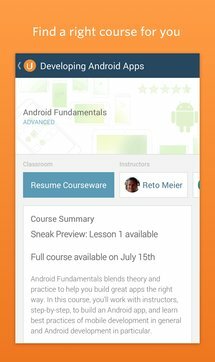 Each course is divided into a series of videos that last about 1 to 2 hours in total (and can be streamed to the Chromecast), with a short description, the author's biography, and a list of related courses. 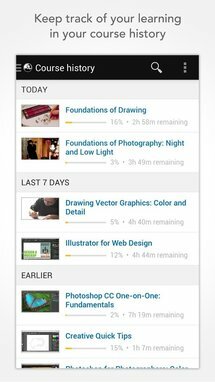 Some of the videos are free to play to give you a taste of the content and the teacher's style, but you will have to buy a $25 monthly membership to watch the entire course or a $37.5 one ($375 yearly) to also access downloadable project files so you can follow along. 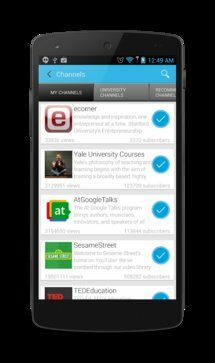 The membership comes with transcripts, certificates of completion for courses, and the ability to create your own video playlists. 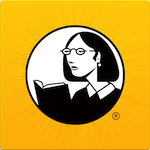 Lynda is not cheap, but if you consider the unlimited access to all content as opposed to how much you would pay for only one university course of the same breadth and quality, you may realize that it's actually very reasonably priced. 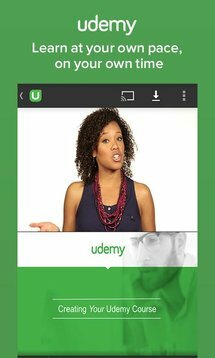 Udemy is closer to Coursera than it is to Lynda, but it mixes features of both services, adds a few of its own, and provides a breadth of coverage that is unrivalled by these apps. Want to take up juggling or learn some bartending tricks? How about SEO and Java programming? 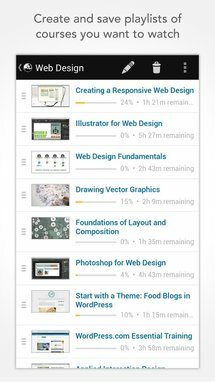 There are courses for these and more on Udemy. Some are free, others are paid. 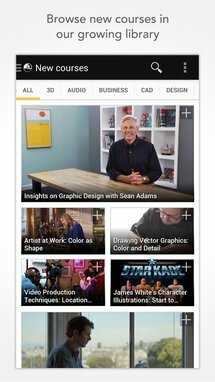 There's no subscription model like Lynda's, so you'll have to buy each course separately, but once you do, you gain unlimited access to it and don't have to keep a subscription to watch the videos again. 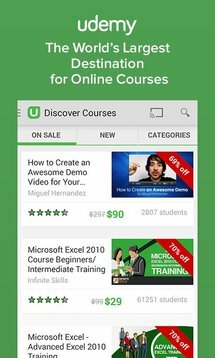 Every Udemy course has a description, information about the instructor, reviews by fellow students, and a list of the lecture videos divided by section. 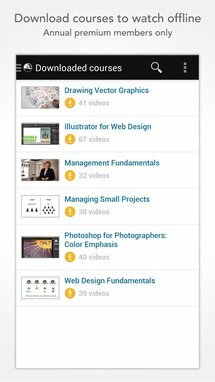 Paid courses often let you preview one video for free to help you decide whether you will like the instructor and lecture's style. Once you join a course, you have access to its discussion and announcement board to communicate with other students and the teacher. As for the actual video playback, Udemy has variable speeds, offline support, and can stream to the Chromecast—a winning combo. 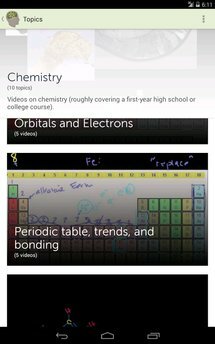 Khan Academy's non-profit organization has thousands of videos providing educational content for free to everyone. The service doesn't have an official Android app yet, so we're forced to go to third-party apps to access its library. 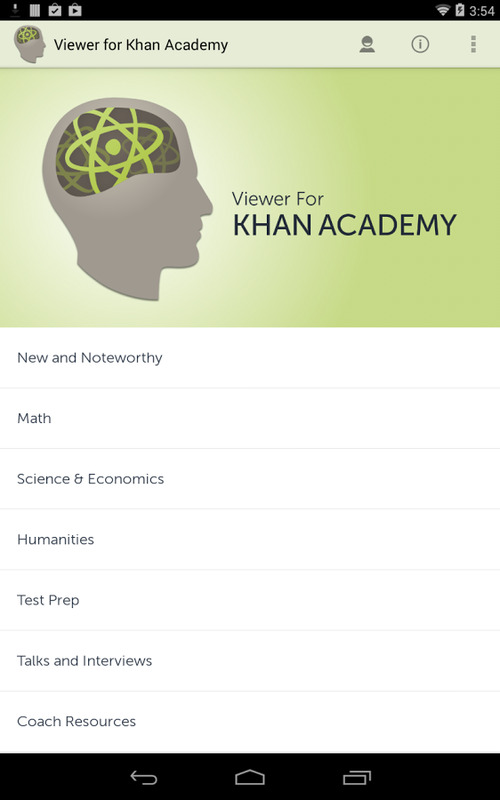 Viewer for Khan Academy is one of the best options now—it has been available for a while and is rather frequently updated. Khan's topics focus more on various sciences and humanities—mostly high-school level content—all explained interactively in neon colors on a dark blackboard. 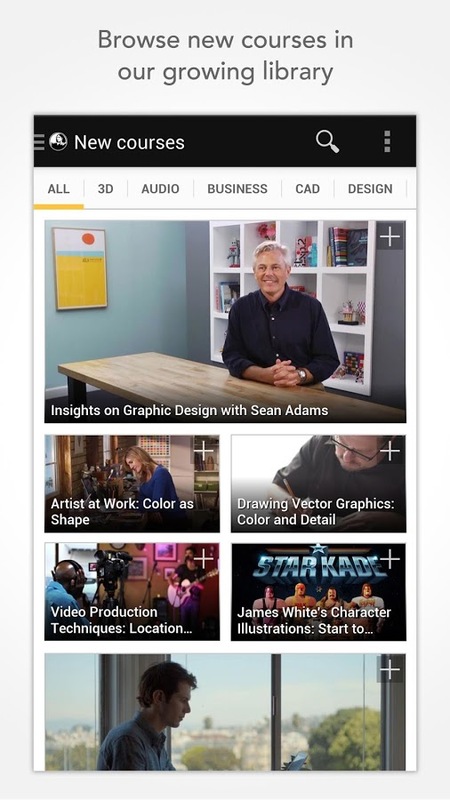 Through the app, videos are available for offline viewing, and provided with hyperlinked subtitles so you can follow along or skip to the parts that interest you most. 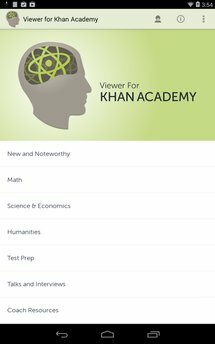 However, Viewer doesn't let you access Khan Academy's signature and highly useful options: progress tracking by topic and practice exercises. If you're not interested in programming, you can skip this app altogether. But if you are, then you simply have to check Udacity. 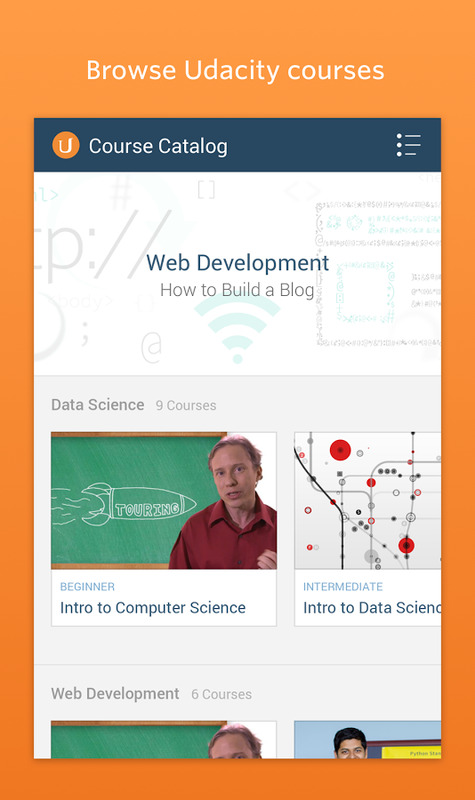 From Cryptography to HTML5, Artificial Intelligence to Software Debugging, Udacity's courses cover all the aspects and subcategories of programming, delving deep into each one, with high quality material provided by the most expert sources (Google, Facebook, Cloudera, to name a few). Udacity's definition of a "course" is closer to the university one than the 2 to 3-hour lecture model employed by most of the apps above. A course is divided into lessons, each several hours long and containing lectures, quizzes, and exercises. These are free (after you sign up for a new account or through Facebook), but if you decide to enroll in a course, you'll also have access to projects, feedback and guidance from a coach, and a verified certificate upon completion. Joe is expecting you to help him with his chemistry homework because, as his father, he believes you know everything, but you have no idea what stoichiometry is and the last time someone had mentioned gases to you, the conversation wasn't exactly about the states of the elements. 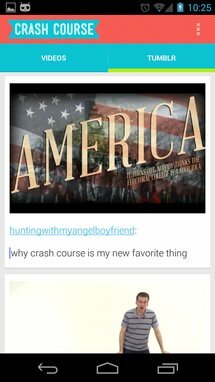 Or maybe, you're having trouble getting Emily away from Instagram long enough to explain that just like that Brannan filter, US History is old but kinda cool. 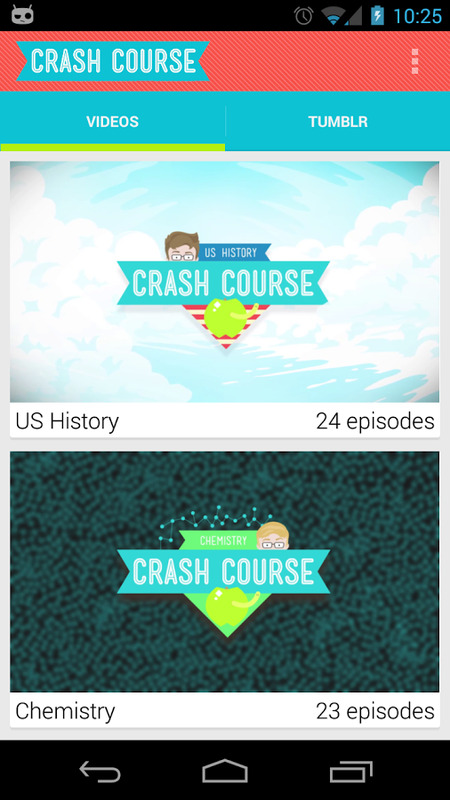 That's where Crash Course's videos can be of incredible help. 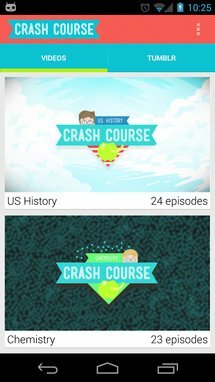 Provided by the VlogBrothers, Hank and John Green, Crash Course's videos manage to make the most boring topics like literature and history fun and interesting again. They are all available on YouTube, in separate channels that you can subscribe to. 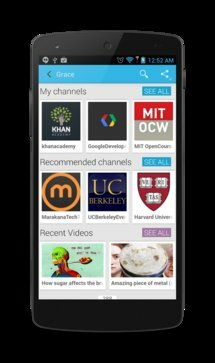 But if you want a better way to browse them, this app parses the playlists and lists all the videos in a nice and handy interface, away from your other YouTube subscriptions. 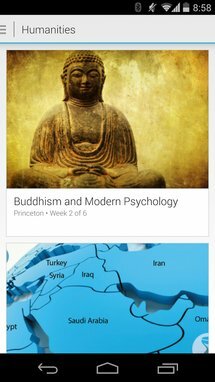 For now, Psychology isn't featured in the app, but History (World and US), Chemistry, Literature, Ecology, and Biology all are. 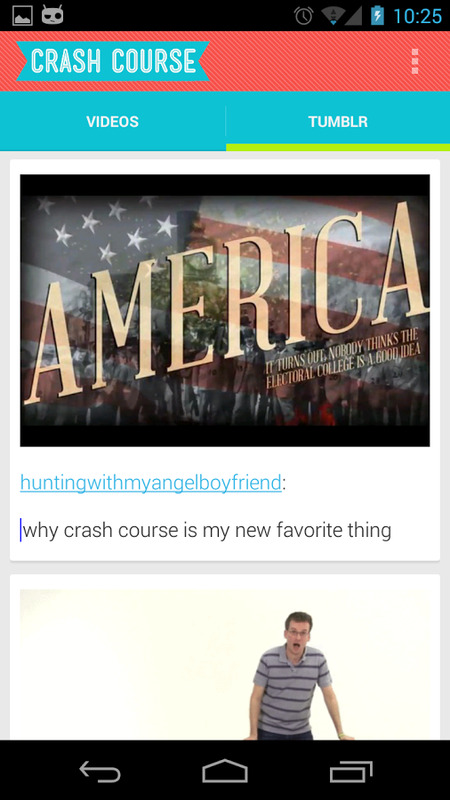 Videos redirect to YouTube, and the app also lists the most recent posts on Crash Course's Tumblr page. 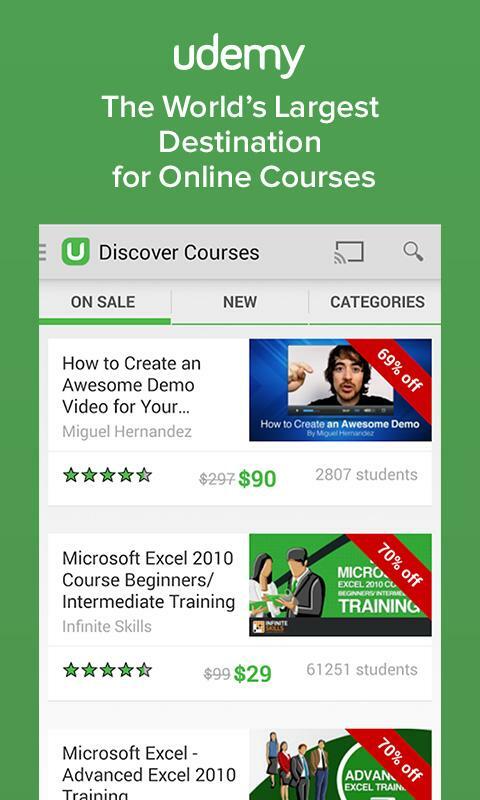 Grace is like a course aggregator and a better YouTube for viewing online courses from various sources. 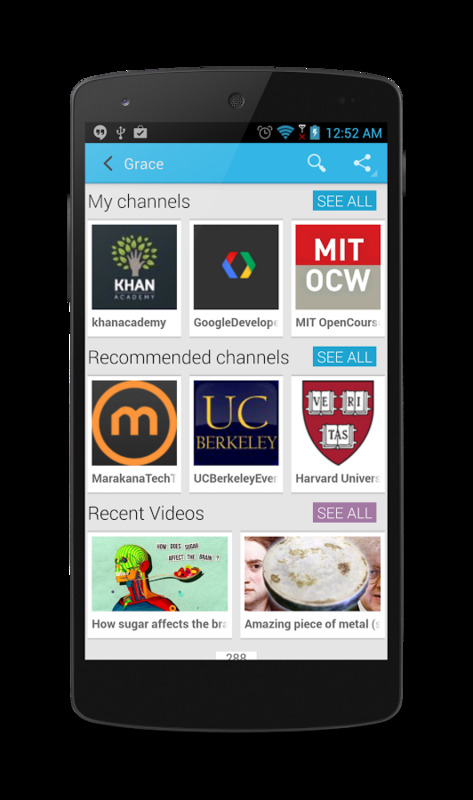 Instead of having to dig for channels you might be interested in, Grace uses YouTube Edu to suggest a curated list that includes TEDEducation, Udacity, Coursera, Khan Academy, MinutePhysics, Mental Floss, Stanford, Harvard, and Yale among others. 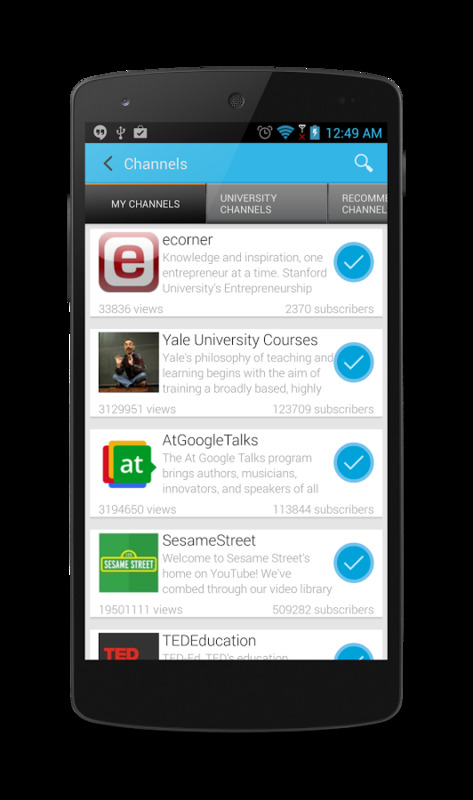 Your channel subscriptions are saved and synced through a Google+ sign in. Grace uses an embedded YouTube player with subtitles and caption support, but its most significant advantage over YouTube is note-taking. 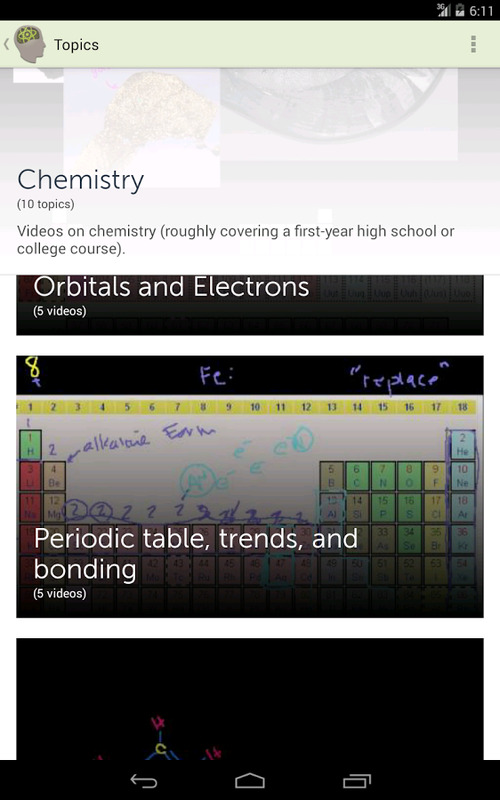 You'll be able to jot down notes with every video and send them to Google Drive. 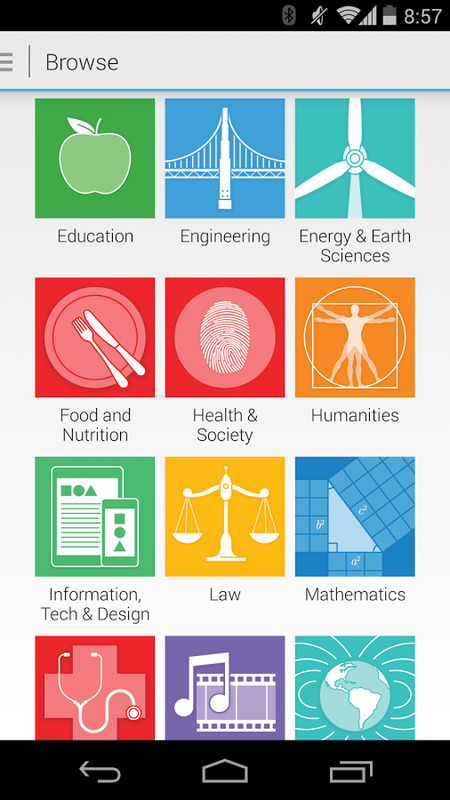 There's a handy Wikipedia button next to each video as well, with links to the pages of the topics discussed within. 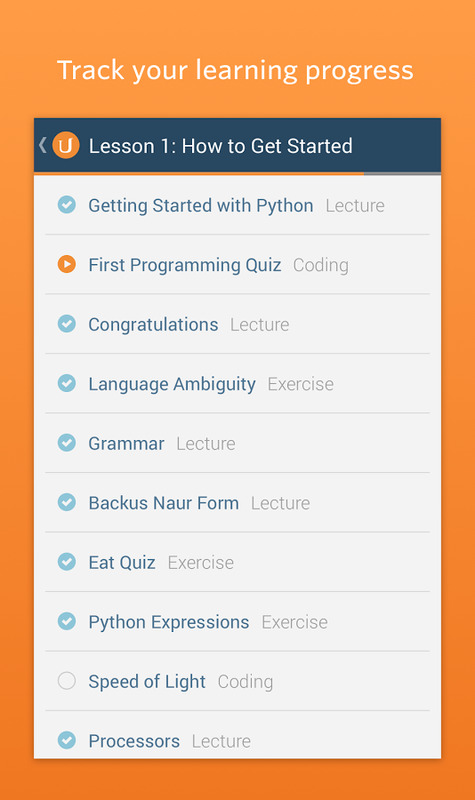 Learnist: a curated list of content on the topics you choose. It includes articles, videos, podcasts, and more. 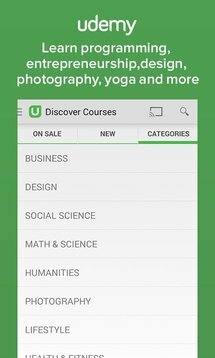 MyOpenCourses: a similar service to KhanAcademy and Coursera, though lesser known but more adherent to the actual course syllabus. 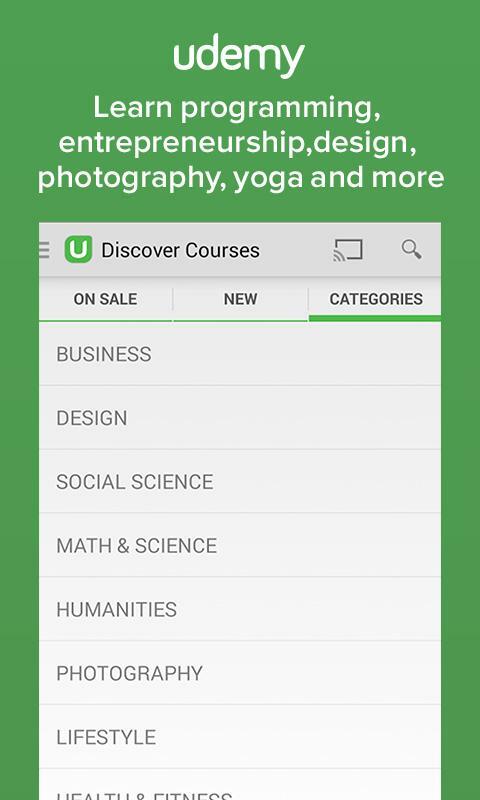 MOOCs4U: like Grace, this is another way to browse Massive Open Online Courses from various providers. 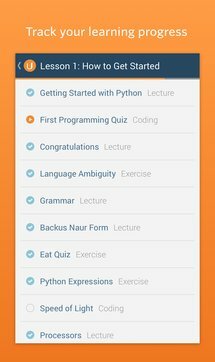 S Educate: a complete Khan Academy app (video viewer, progress tracker, and exercise provider) made by Samsung for Samsung devices. Noodle Learn: a learning tool with personally curated content (videos, websites, games) related to various topics. 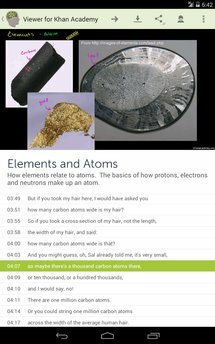 Kompi: another good Khan Academy video browser and player. 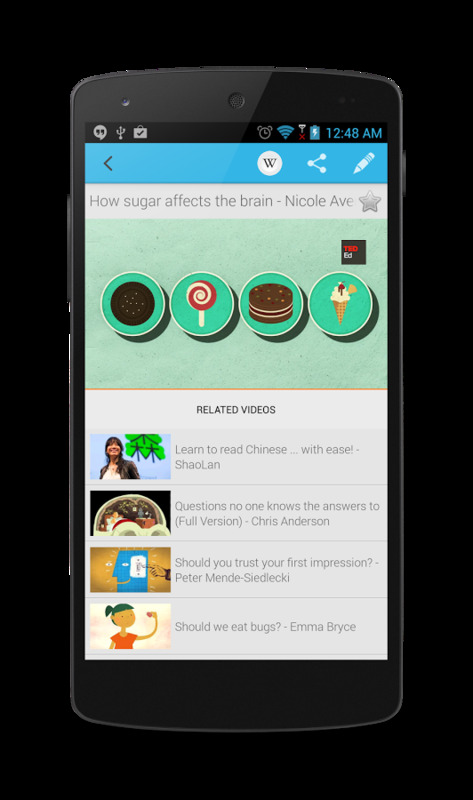 We all know that videos are easier to follow and assimilate than unending pages of text. 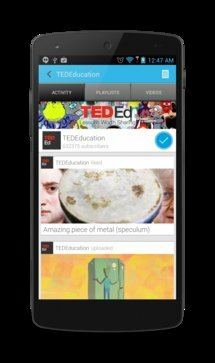 Thanks to the above apps, educational videos are also accessible anywhere with your phone or tablet and (mostly) available offline. You just have no more excuses when it comes to learning.